Abstract: The MSI Metis 266 SlimPC AMD AthlonXP bare bones system. Sleek, black, and packed full of features like video, audio, and networking. 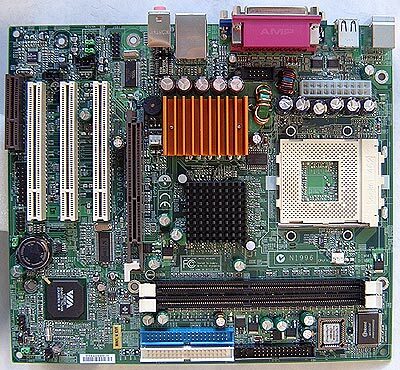 The backbone of the Metis 266 is the MSI 6390 motherboard. It's based on VIA's KM266 chipset which is basically the KT266A with an integrated ProSavage8 videocard. The board has support for any 200/266 MHz based Athlon processor (it does not support 333 MHz chips) and the two DIMM slots can handle up to 2GB of PC1600/2100 DDR RAM. The first thing that catches your eye when you lay your eyes on this motherboard is the massive heatsink on the MOSFETS. Good job MSI, they must generate a lot of heat and remember this is a value oriented mainboard so it is unlikely MSI did this for sake of appearances. We were a bit surprised with the small passive heatsink on the northbridge. As mentioned earlier, the KM266 is based on the KT266A which on most other motherboards had active cooling plus a ProSavage8 videocard. The good news is during testing we didn't have any stability problems and the board worked quite well. It's nice to see that MSI has taken the time to choose a board with an AGP slot for the Metis266 so consumers can upgrade to a videocard if they wish. With three extra PCI slots you should have all the expansion needs covered. While the MSI G4MX440-8XT videocard is NOT INCLUDED with the Metis266 SlimPC, we opted to test it the system with the GF4MX440 card. Integrated graphics are sufficient, but drop in a videocard such as this and the true potential of the system is realized. 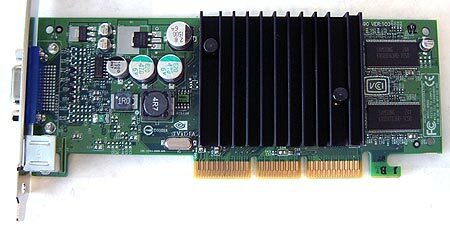 Based on the GeForce4 MX440SE core, the videocard we tested with is backed up by 64MB of 5ns Samsung TSOP-II DDR Memory. Since the GeForce4 MX does not generate that much heat, a large (silent) passive heatsink is all that is required. The card also has TV Out capabilities which are a nice addition. Even thought the MSI G4MX440-8XT is a value market videocard, we were glad to see that MSI used a good amount of thermal paste between the GPU and Northbridge. A full review of this card can be found here, now let's see how the Metis266 Slim PC handles some office productivity benchmarks. Pg 9. So How Does The Metis 266 Perform?